Love Like This Life: Caring for the Caregiver SCHOLARSHIP WINNERS! My heart is so full this morning. I'm so happy to know some very, VERY generous people who want to help caregivers. A few weeks ago, a good friend - who will remain anonymous - but just know I love this woman! - had this idea. To help a caregiver. To give a caregiver a break. She gets it, because she is a caregiver herself! 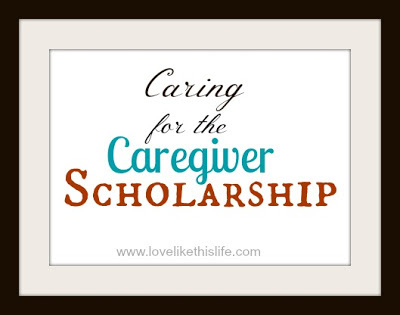 So, we put the "Caring for the Caregiver" Scholarship together. I couldn't wait to bless someone with this awesome opportunity. Then - something amazing happened! Another amazingly generous woman - who will also remain anonymous - told me to give away TWO scholarships! I'm not even done, y'all! Not long after that, another friend told me she wanted in on the giving, too! So, she is contributing a manicure/pedicure or some other sort of spa treatment of their choice to a third winner! She will also remain anonymous, but she gets it too, because she is also a caregiver! It is with much joy and anticipation that I announce the winners of the scholarships! This is a $400 value. It can be used all at once, at a hotel for four nights at up to $100/night, or one night at a time, also sticking to the $100/night price point. You can stay at the hotel, or you can put your loved on up there. You are responsible to make sure their care is arranged for while you are on your getaway. I'd love to hear about it when you go! I will e-mail all of you with details on how we are arranging payment. Look for an e-mail from me very soon, and we'll stay in touch. CONGRATULATIONS to the caregivers who won, and THANK YOU to our generous sponsors and a big thank you to ALL of you who entered. I loved reading all of your stories. I love every single one of you, and I'm so thankful that we are all in this together.